The exhibition, The Journey: West that will take place in two locations in parallel, in two cities, and is the prologue and introduction to the 57th Biennale during which the Artist, Jack Jano will be participating in a solo non-profit Exhibition, in Venice (May-July). Jano was invited to exhibit his works for the completion of the Jewish Ghetto of Venice 500 years commemorations, the first of its kind in the world. The name of the Exhibition The Journey: West is derived as a prologue to the exhibition in Venice, the city which is Westwards from here, and which places its metaphorical feet in the Sea which threatens to “swallow” it (one of the words for west in Hebrew is "Yama", which comes from "Yam", the word sea). In addition to being a wide and intense perspective of the artist's creative career over a number of decades, the exhibition is a “Creativity Encouragement Sale” to raise funds for the forthcoming travels of Jano to Venice, as a "headstart" model of supporting art, and where art connoisseurs can be exposed to the wealth of Jack Jano’s art offered at various price ranges. Hebrew motifs in the form of letters, allegories from the Judaic scripts inscribed with fire on metal sheets, the rounded roofs of the tombs of the righteous, synagogues and alms for the poor, all represent the relevance of living along-side the righteous. Wheels carrying houses, torn books being delivered, and sea mongers boats symbolize the unsettled social wanderings – A life story of a 7 year old immigrant from Morocco. Self-portraits in conjunction with cut paper and photographs are “treated” together with pieces of cloth, color, wood and metal, combining an effect of the “brokenness” of the many faces. Pieces in the image of many, social icons and humoristic finger-pointing or biographies, such as the image of Jano reflected in the face and colors of Van Gogh – the first artist that he knew and became like an “artistic father" and Role Model at the onset. Scattered in the space is an ideological jumble of mediums and imagery, pressing buttons loaded with reaction. Jano chooses to make his creations with materials others have chosen to hide. The combination of mediums based on raw materials gathered almost entirely from local fields and waste disposal sites in the Galilee - his natural environment, creating a cyclic motion of regeneration from total destruction. In his investigation of matter during the creative process, Jano appropriates the qualities of the four elements: The branding of fire on metal; the transfiguration of materials in the metamorphosis of the creation by anointment of the metal in water thereby transfiguring it to rust and patina. The use of water as a mirror of reflection of the creation and environment and the transfiguration of air from “non-concrete” to “concrete”, tangible and perceptible, cutting letters and shapes from inside the creation outwards, creating a space with a perceptible border, presence and shape. And finally, earth, from whom the materials of the Artist arise, connecting him as ‘The man who lives at the peak of the mountain’, interlaced inside the creation itself. Jack Jano – dynamic plastic artist, reestablishes the borderless existence in an exhibition that reflects his internal journey for identity, realization and spirituality. Commemorating the creation of the first Jewish Ghetto in the world, 500 years ago, in Venice and the opening of the 57th Biennale in the city, the Italian Art Organization “One Contemporary” in conjunction with the Curator Pier Paolo Scelsi, Venice's City Council and Israeli Embassy in Rome, invited the artist Jack Jano under the auspices of the Engel Gallery to present his works. Jano was invited to exhibit a large scale installation on Giudecca island for a period of three months (May-July) in an exhibition named “Law of Superposition: A Hebrew Installation”. In addition, Jano will take part in an all Israeli Exhibition at The Jewish Museum of Venice during the six months of the Biennale as well as preforming in Venice’s Ghetto square as part of that same exhibition. 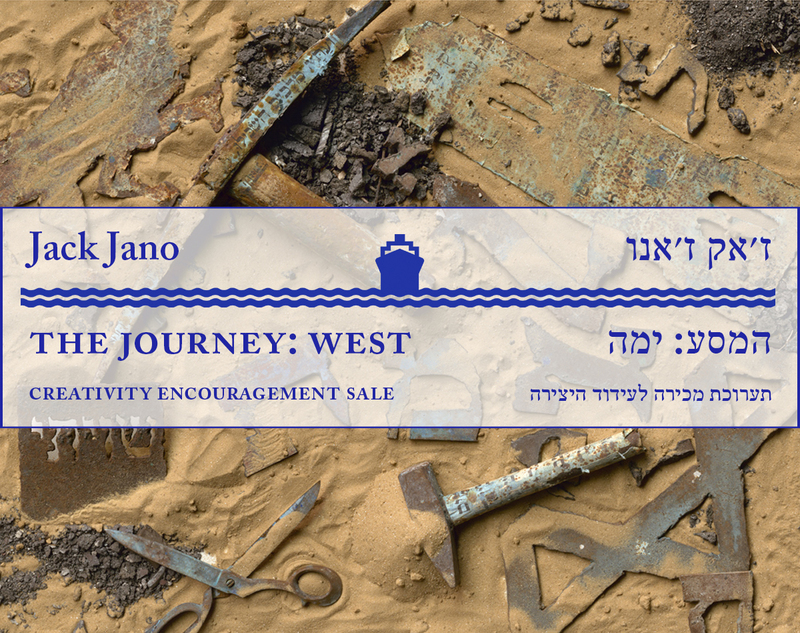 this collaboration connects Jano’s exhibition to the story of the Jewish journey. ???? : ??? - ?????? ???? ?? ???? ?'?? ?'??? ?????? ????? ?????? ????? ?, ??????? ???? ?? ???? ???????? ?? ???? : ??? ???? | ??????? : ????? ??????? ?????? "??? ?- ???" ??????? ???? ???? ?, ???? ???? ???? ?, ???? ????? ????? ???????? ?????? ?? ???? ?'?? ?'??? ???? ??????? ?-57 ??????? (??? - ????) ?????? ???? ?????? ???? ???? ?????? ??? ?, ???? ????? ????? ?? ??????? ?, ????? ??? ?????? ??? ?- 500 ????? ???? ?????? ??????? - ??? ?????? ?????. ?? ??????? "???? - ???" ???? ?????? ???? ??????? ???? ?????? ?, ???? ?????? "????? ????" ?? ????? ??? ???? ????? ????? ?? ?, ?????? "?????" ????. ???? ?? ???? "???? - ???" ?????? ?????? ????????? ???? ??????????? ??????? ???? ??????? ??????? ?, ???? ?? "?????? ????? ?????? ??????" ????? ????? ????? ????? ??????? ??????? ?????? ?? ?'?? ?'?? ?, ???????. ????? "Head Start" ?????? ?????? ?, ?? ????? ????? ?????? ?????? ????? ???????? ??????? ?????? ?????. ??????? ?? ?????? ?????? ?????? ?? "?, ??????? ??? ???? ????? ??? ?, ????? ???? ?? ???? ????? ????? ?, ??? ???? ?????? ???? ??????? ??? ?? ?????? ????? ??? ??????. ?????? ????? ??? ?, ?????? ?????? ????? ?????? ?????? ???? ?, ?????? ??? ??????? ??????? ??????? - ??? ????? ???? ????? ???? 7 ??????. ???????? ?????? ?????? ???? ???? ???????? "???????" ???? ?????? ? ?, ??? ????? ?? ???? ?, ?????? ?????? "??????" ????? ????. ???? ????? ???? ?, ??????? ???????? ??????? ??????????? ?? ???????? ?, ?????? ?? ?'??? ?????? ???? ???? ???? ?????????? ?? ???? ??? - ???? ?????? ????? ???? ?? ?"?? ???????" ????? ????? ?, ?????? ????. ???? ??????? ???? ??????? ????? ?????? ?? ??????? ??????? ?, ????? ?????? ?????. ?'??? ???? ????? ?? ?????? ??????? ?????? ???? ??????. ????? ?????? ?????? ?????? ???? ??????? ????? "????" ?????? ?????? ????? - ?????? ????? ?, ??????? ????? ????? ??????? ?????? ?? ?????? ????. ?'??? ???? ???? ?????? ????? ?????? ?, ?? ????? ?????? ???? - ????? ?????? ?? ???? ?, ????? "??????" ????? ?????? ????????? ?? ??? ????? ????? ???? ?????? ??????. ?????? ???? ????? ???????? ?? ?????? ???????. ????? ?????? ??? ?"???" ? - "??" ????? ??????? ?, ??????? ????? ?????? ?????? ???? ?????? ???? ?, ??????? ??? ????? ???? ???? ????? ????????. ????? ????? ???? ???? ????? ?????? ???? ?'??? ???? ??? ??? ?? ???? ?? ? ?, ??????? ???? ?????? ????. ??? ?'??? - ??? ????? ????? ?, ???? ???? ?????? ??????? ?????? ??? ????? ??? ??? ?, ????? ????????. ?? ?????? ????? ???????????? : ???? ????? ????? ??? ?????? ??? ?- 500 ???? ?????? ?????? ???? ?, ??????? ?????? ???????? ? - 57 ??? ?, ????? ????? ?????? ??????? "One Contemporary" ?????? ????? ???? ????? ??? ?, ????? ???? ????? ????????? ???????? ????? ?? ???? ?'?? ?'??? ?????? ???? ????? ?? ????????. ?'??? ????? ????? ???? ????? ?????? ?? ??? ?'????? ????? ?????? ???-???? ??? "????? ???????????? : ???? ?????". ??????? ?? ????? ?????? ??? ?, ????? ?'??? ???? ?????? ???????? ??????? ???? ?, ????? ??? ??? ?, ??? ???? ??????? ???????? ??????? ?????? ?, ??????? ????????. ??? ??? ???????? ??????? ???? 500 ???? ?????? ??????? ???? ?????? ????? ???? ???? ?? ?? ?? ?????? ???? ???? ??????? ??? ??? ?, ?? ???? ????? ?? ??? ????? ???????? ?????? ?????? ?- ?????? ?- ???????. ??? ? ?, ????? ?? ???? ?????? ?????? ???? ?????? ??????? - ??????. ???? ?, ?'??? ???? ??? ??????? ????? ??????? ???????? ?????? ?????? ????? ??? ????? ??????? ??? ???? ????? ???????? ????? ???? ?????? ???? ??????? ??. ????? ????? ?? ???? ?? ??????? ?? ?'??? ??????? ?? ???? ????? ?.